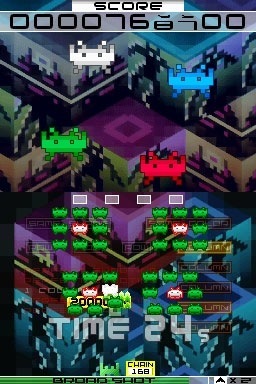 Space Invaders may be 31 years old... but it hasn't lost its charm. 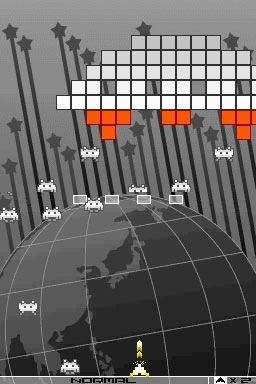 Improving on last year's formula presented in Space Invaders Extreme, Space Invaders Extreme 2 still combines the upbeat music with some interesting twists on the classic arcade shooter. Although I played the previous game on the PSP, the similarities with this DS version are apparent, but there is so much happening on screen that for the first few times I was playing I couldn't help but feel completely lost and confused, uttering "I don't know WTF is going on anymore!" as my husband would look at me apparently amused. There definitely is a lot going on, and reading the manual helped me understand the little twists and complex rules behind what is seemingly a simplistic button-masher. 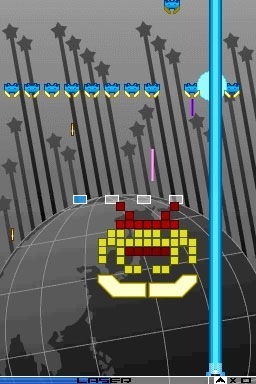 You can choose to start your game in Beginner or Normal difficulty in Score Attack Mode, where you go through the five levels attempting the best possible score. 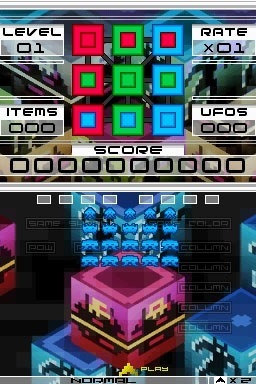 In Time Attack, the goal is to go through all five levels as quickly as possible. 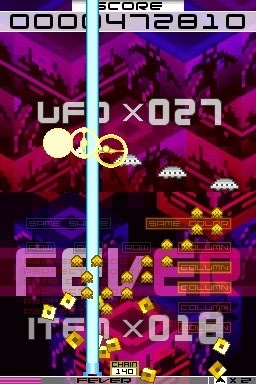 The gameplay takes places across the two screens, with the main field and most of the action taking place on the touch screen. However, there is a lot going on on the top screen as well, although most of the time I would easily miss it. For the most part of the rounds, the top screen is an indicator of your score, UFOs killed, cannon level, items grabbed and other things like the Bingo Panel. The Bingo Panel is a color combination grid made of two-toned squares that you "light up" by picking up the respective color power-ups. 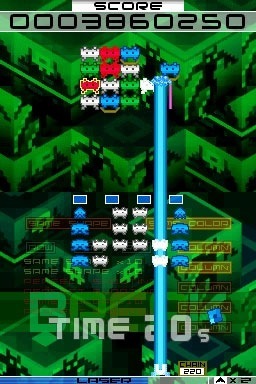 To obtain a power-up, you must kill four invaders of the same color. 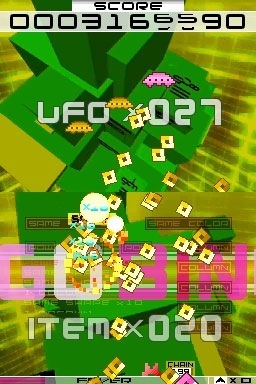 If you shoot down a UFO, more invaders will appear on the top screen. If you manage to shoot all of them (or fulfill whatever the objective of this round may be) you enter Fever Time. 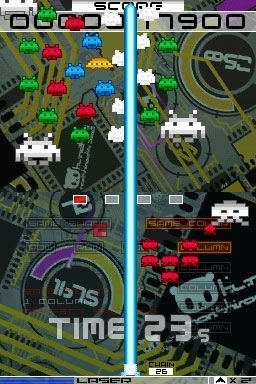 At this point, all invaders on the touch screen will turn yellow, while UFOs will fly around on the top screen. Shooting them down always drops items worth 1000 points. Your score at the end of this time will be calculated according to the number of UFOs you shot down plus the number of items you picked up. And yes, I only know this because the manual says so. All I do really is press the A button furiously to shoot everything and try to pay attention to what's shooting at me from above. With so much going on on screen, it's easy to lose track of some things. 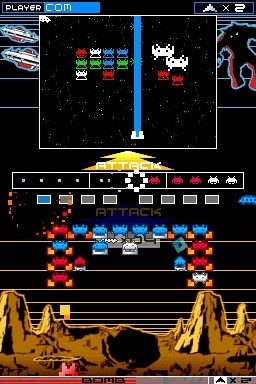 There are different colors of invaders, flashing ones that change colors, multiplying invaders, other that explode, some that turn sideways becoming more difficult to hit, UFOs of different colors that have specific abilities, things that shoot in different directions... text lights up in the background when you create chains (column, row, same color invaders) and then there are always the Boss fights. 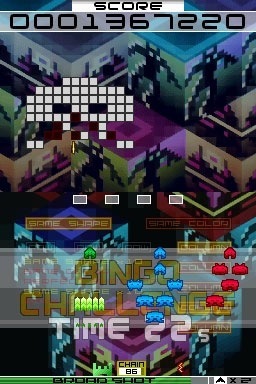 Unlike in the previous SIE, you don't play Arkanoid/Breakout to kill the boss anymore. Instead, you shoot at it and try to avoid whatever it's throwing at you, being lasers, shots, blasts, coming down to land on your head, spitting out more invaders, and other equally fun stuff. Once again, the sound effects complement the background music beat, so every time you shoot your cannon, every time you hit an invader, every time you kill one, the sounds made will fit into the tune, which makes it similar to Meteos in the sound/music department. Ok, so it's not a game for thinking, but mindless fun is just that, mindless fun. Something that you play now for a bit, then come back again later to pick up where you left off. And aside from not knowing what the heck was going on most of the time with so much stuff moving around the screen, I still kept on going "pew pew!" (sometimes out loud too) on those pesky invaders. The Earth will be safe as long as I keep pressing the A button! Special thanks to Klee Kuo and Square Enix for providing a copy of this title.